We drill a series of holes along the base of an affected wall and apply sufficient Ab-Tech Damp Proofing Liquid into the holes by gravity feed. This produces a continuous band of silicone damp-course where needed. The liquid is free-flowing and soaks the fine pore structure of the mortar and base masonry. The silicone component of the siloxane liquid cures to form a band of moisture-repellent plastic damp-course, inside the wall material itself. We then patch the holes with matching mortar or plaster and clean up to finish the job neatly and tidily. The holes are concealed to blend in with the existing walls. 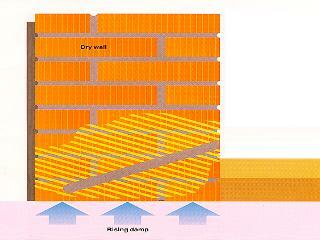 Chemical injection of walls to create a damp-course is a technique that was developed in Europe in the 1960's and has been used there successfully since then. Modern siloxane damp-proofing liquid is a further improvement. GRAVITY FEED or PRESSURE INJECTION? It does not matter how the damp-proofing liquid is put into the wall. There is no Australian Standard covering the topic, however, the British Standard for the "Installation of Chemical Damp-Proof Courses" allows several rational methods, either low pressure injection, high pressure injection or gravity feed. The important factors are that the operator uses sufficient liquid and applies it correctly to allow it to soak fully across and along the wall to create a continuous silicone damp-course. We use gravity feed injection in all types of walls. Based on our experience, we apply a generous rate of Ab-Tech damp-proofing liquid to ensure that a broad continuous layer of silicone damp-course is created in the wall. To achieve this, we apply small quantities of the damp proofing liquid directly into each of the the drilled holes, without any pressure, allow it to soak in and repeat until the recommended total application rate quantity is attained. The close spacing of holes and the repeated application of small doses of liquid ensures that the treatment disperses reasonably evenly throughout the target layer in the wall. If there are voids in the wall the liquid will pool in bottom of such holes and soak into the adjoining masonry. Particularly, the old mortar is very porous and will absorb the liquid on contact and help it disperse through the wall by natural capillary action. Ab-Tech Damp Proofing Liquid is a high purity alkyl-silicone (siloxane-silane), diluted in a user-friendly low odour petroleum solvent, in a ready-to-use form. The components have a small molecular structure that allows the liquid to soak deeply into masonry materials by capillary action, and carry the water-repellent properties into even the smallest pore space. After application, the solvent slowly evaporates and the silicone component chemically reacts with natural moisture to form a water-repellent silicone plastic layer throughout the wall. The residual silicone is inert, resistant to salts and alkalis and is non-toxic after curing. surfaces remain porous and able to "breathe"
Ab-Tech Damp Proofing Liquid is blended and packaged in South Australia. The component chemicals have been selected to provide the most effective damp-proofing and to be as safe and user-friendly as we can achieve. The liquid has little odour and is not aggressive to materials and finishes. The formulation avoids the dangerous and harmful types of solvents. Rising damp in South Australia activates salts in the walls. Our siloxane liquid has been developed to resist such salts and is the best material available for such conditions. Some cheaper silicones and older technology liquids such as stearates and siliconates do not have the same degree of salt resistance. We use expensive solvent in our liquid that is the safest available and has the least smell. Beware that there are cheaper liquids available with harmful solvents that smell bad. We use high flash point petroleum components that have a reduced fire risk compared with flammable petroleum liquid. Our product is rated as Combustible Liquid and is not classified as Dangerous Goods according to the Australian Dangerous Goods Code. However, there are still risks and users should observe the Safety Precautions printed on each can of our product.